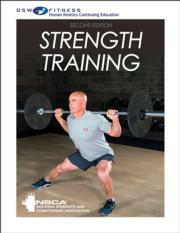 Developed by a team of experts chosen by the National Strength and Conditioning Association (NSCA), Strength Training, Second Edition CE Course, provides an unmatched depth of coverage on all aspects of developing strength. It addresses critical topics such as strength assessments and includes the essentials of program design, guidance on nutrition for strength development, and thorough coverage of how muscles are trained and how they grow, setting the stage for optimal results. The exercises in the second edition of the Strength Training book feature color photos and use nearly every piece of equipment available, allowing you to tailor workouts to each client. Whether you’re designing a new resistance training program or fine-tuning an existing regimen, Strength Training CE Course will help you ensure proper technique, safety, and progressions for proven success in increasing muscle mass, strength, power, and muscular endurance. Understand the science and physiology of strength training and the factors that contribute to the development of strength. Know the principles of strength training and effective strength training program design. Use a variety of testing and assessment tools to evaluate strength and power and interpret the results to design effective training programs. Understand the principles of proper nutrition and hydration for strength training. Design safe and effective endurance training programs to meet specific goals for a variety of abilities and ages. Be familiar with a variety of strength training programs, exercises, and training plans to maximize the development of strength.